TSG digitally transforms geological samples into mineralogical information products. TSGTM is the market-leading, industry standard software program for the interactive analysis, visualisation and mineralogical interpretation of VIS/NIR/SWIR/TIR reflectance spectra. Qualitative and quantitative mineral results generated in TSG improve geologists’ efficiency, productivity and knowledge-base, leading to actionable insights and informed decision-making. Hand-held infrared spectrometers (e.g. Malvern Panalytical ASD’s TerraSpec® and Halo, Spectral Evolution’s oreXpress and the ARCoptix infrared spectrometers. HyLogger systems, the CSIRO-developed automated imaging and hyperspectral core logging systems, located in each Australian Geological Survey, commercially available for international deployment through Corescan Pty Ltd.
TSG is developed by, and marketed under license from, the Commonwealth Scientific Industrial Research Organisation (CSIRO). Spectral Geoscience is a CSIRO authorised sales affiliate of TSG. New timed licensing and pricing options provide flexible options for TSG users to manage the timed access according to project and company needs, removing the upfront costs of software ownership. TSG subscribers receive the latest TSG software updates as they are released. TSG™ purchased via the secure CSIRO sales portal link will entitle users to support and discounted training from Spectral Geoscience. A purchase order may be emailed to us for order fulfillment. Digital activation codes will be emailed directly. Choose a time block licence period from 24 hours to 3 years. Upgrades released during your purchased time block are automatically installed when internet access is available to check for updates. No annual maintenance costs. No dongles. TSG software performs as a FREE Viewer until a time block licence is purchased. TSG reverts to the FREE Viewer after a time block licence expires. Subsequent TSG time block licences can be purchased. Contact us for a FREE demonstration dataset in TSG 8 format. International sales, support and training for TSG™. Download the free TSG Base licence here. Open TSG. Under TSG’s Help->Licence menu; activate the licence, then click ‘Purchase time’. Your web browser will open on TSG’s online store, purchase the time-block licence to meet your needs. After the purchase, click Refresh back in TSG’s licence dialog. phone, email or online meetings. Identifying the mineralogy in drill core, chips, soils and grab samples is a primary objective for successful mineral exploration, mine planning and development, geometallurgical flow sheet design and environmental-remediation practices. TSG supports geoscientists at each step in the exploration-mining value chain by providing rapid characterisation results of infrared-active mineralogy to generate actionable insights. Complimentary datasets such as assays, lithology logs and down-hole geophysical results, can be imported to evaluate the spatial relationships with the spectro-mineralogical results generated in TSG. TSG can process thousands of spectra on-the-fly and rapidly generate mineral information critical for the characterisation of the regolith, host rock and alteration associated with ore deposits. 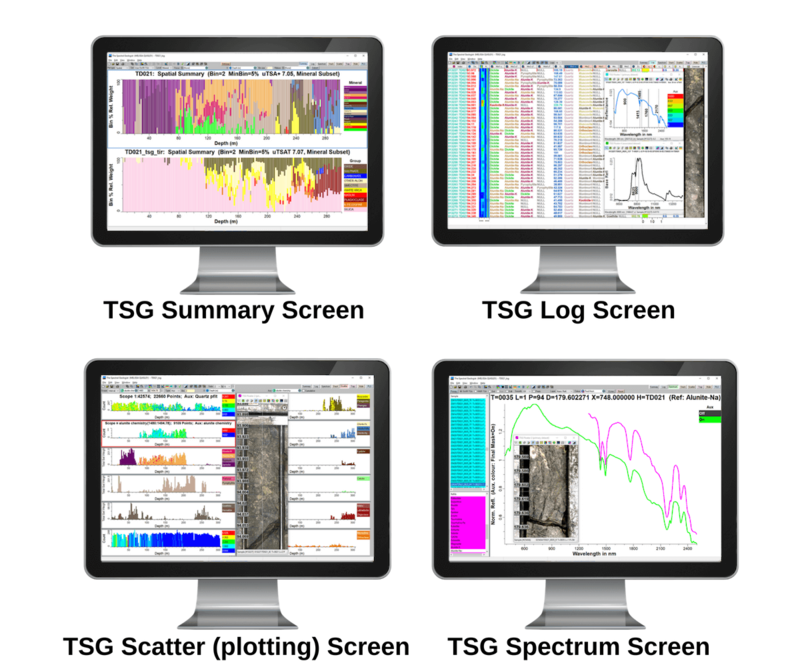 TSG is designed for the interactive analysis and visualisation of infrared spectra, mineralogical results, associated imagery and ancillary data. Users are provided with several analysis options for extracting mineral information from infrared spectra. These range from a first-pass automated interpretation using built-in algorithms to more sophisticated scalar-based tools for the experienced user. Algorithms for the automated interpretation of spectra (TSA+ for the SWIR and jCLST for the TIR). 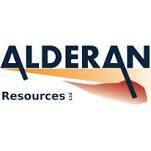 Enhancements to take full advantage of VNIR-SWIR+TIR data collected with HyLogger hyperspectral core logging systems. Compositional changes within a mineral group (e.g. Al-Fe/Mg in white micas and Fe-Mg in chlorites). Down-hole, depth-registered logs of mineralogy and associated attributes (alpha and numeric formats). Scatter plots and histograms saved as JPG, PNG, EMF and TIF. CSV files exported for easy integration with third party software. Down-sampling optional (e.g. 2m composites). HyLogger imagery export of automatically configured and labelled core trays and mosaics of core trays per drill hole. TSG version 8 replaces all earlier versions (e.g. TSG Pro, Core, HotCore and Enterprise) and bundles the previously seperated functionality into one powerful package, TSG 8. There is now only one ‘TSG’ and the free ‘ TSG Viewer’. 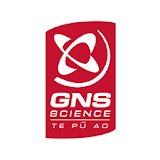 TSG is a trademark of the Commonwealth Scientific Industrial Research Organisation (CSIRO).